National flag carrier Nepal Airlines has announced a special offer on its flight to Bangkok of Thailand. Under the scheme announced on Thursday, it will offer roundtrip ticket at Rs 12,000 on the Kathmandu-Bangkok sector, exclusive of applicable taxes. After including all applicable taxes, the roundtrip airfare to Bangkok from Kathmandu will cost approximately Rs 26,000, according to officials of the Nepal Airlines Corporation (NAC). The airfare is lower than that offered by any other airline at the moment. Under the scheme, Nepal Airlines will also offer one free ticket on the purchase of five roundtrip tickets in the sector. 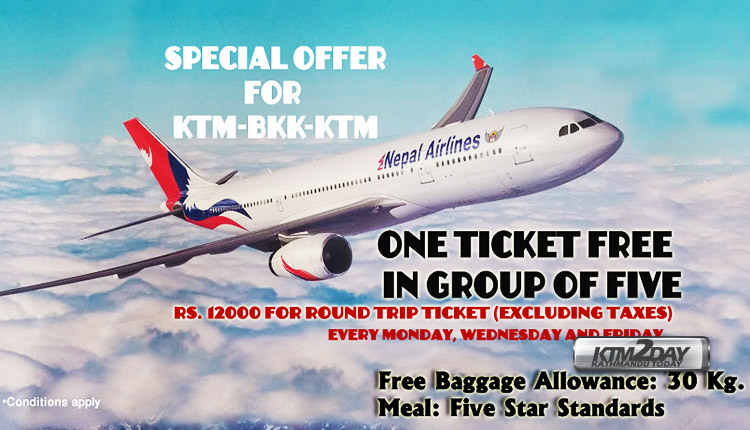 Nepal Airlines has been operating three flights a week to Bangkok from Kathmandu — on Monday, Wednesday, and Friday.The offer will last till March end. By introducing the promotional offer, the airlines aims at tapping into the growing number of Nepali vacation and holiday travelers, particularly to low-cost destinations like Thailand. “We hope that the new offer at a time when Bangkok is a preferred destination for Nepali travelers for holiday will become a boon,” said Koirala. Under the offer, the airlines will allow 30-kg free baggage, and serve meal of five-star standard. “Most of the budget carriers only allow hand baggage and no meal for the fliers. 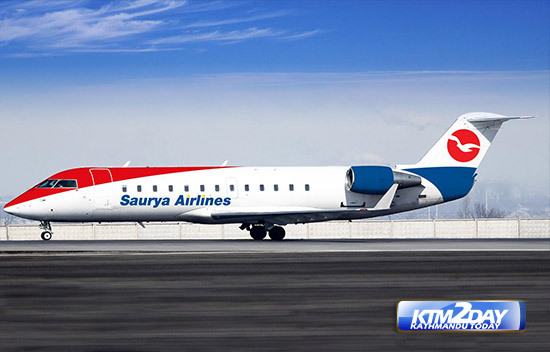 We will offer five-star standard meal and 30-kg free baggage at the cheapest airfare,” he added. According to Koirala, the NAC used to charge up to Rs 33,000 for each roundtrip ticket during the peak season. 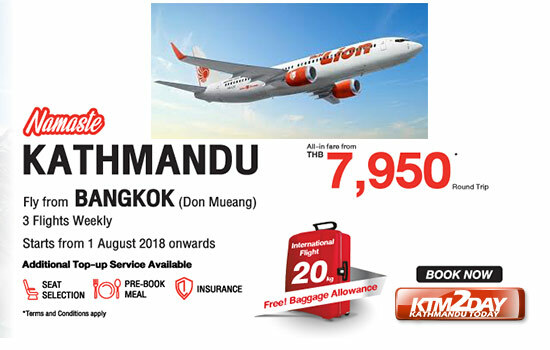 The promotional offer is also expected to increase competition among the airlines that operate flights on the Bangkok-Kathmandu sector. Earlier in November, the NRB lowered the foreign exchange limit to US$1,500 for Nepali nationals traveling abroad for leisure, private visit or tourism purpose, down from the earlier limit of $2,500.